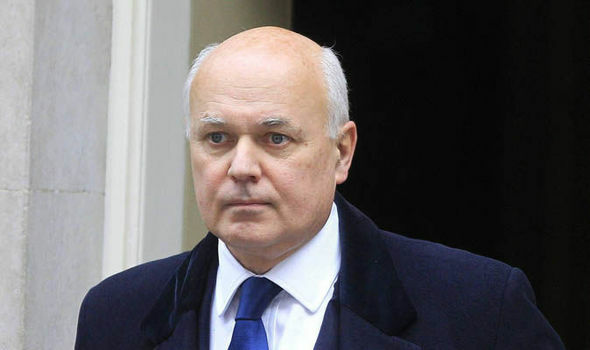 TORY minister Iain Duncan Smith yesterday said the campaign for Britain to quit the EU “may well carry the day” in the forthcoming in-or-out referendum. The Work and Pensions Secretary told MPs that “out” campaigners were making a “powerful argument” in the debate over whether to cut ties with Brussels. He spoke out in the Commons after being questioned by Tory Philip Davies, a leading campaigner for withdrawal from the EU. Mr Duncan Smith said: “They’ll all have a vote on that and I suggest at that moment you are able to make that powerful argument, and I’m sure that no doubt under your rhetoric you may well carry the day.”A call for all five million British citizens living abroad to be given a vote in the EU referendum was withdrawn in the Lords yesterday. Only those who have lived in the UK within the last 15 years are currently allowed to vote.